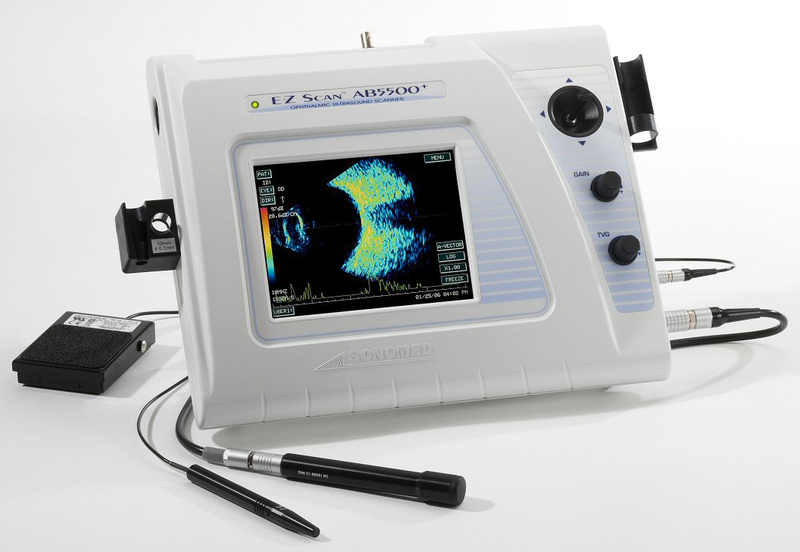 E-Z Scan B5500+ B-Scan - Gold Coast Ophthalmic Instruments, Inc. Call (877) 701-3937 for information. The E-Z Scan B5500+ provides excellent resolution with a full set of features including zoom and pan capabilities, multiple color and grayscale display modes, measurement functions, annotation, and more. The real-time B-scan display, adjustable gain and TVG controls, and enhanced “high-resolution” mode which produces a scan with 256 line vectors facilitate optimal diagnostic viewing. Receive special offers including "Buy one, get one free" and FREE shipping. Gold Coast purchases pre-owned equipment. Gold Coast purchases pre-owned equipment. If you have equipment you would like to sell or trade-in you can contact us by phone or email a picture and description of the item you are interested in selling at sales@goldcoastop.com for a free quote. As an option for our customers, Gold Coast can accept a “trade-in” of quality pre-owned equipment to be used toward a new equipment purchase. Gold Coast offers high quality used and refurbished exam lane packages as well as other rebuilt and reconditioned ophthalmic equipment to fit every practice’s budget. This cost-efficient equipment passes our stringent quality assurance tests and comes with a limited warranty. All equipment is tested and brought to original manufacturers standards to assure our clients of reliability and performance. Please contact us for a complete list of currently available equipment. If there is a specific piece of refurbished or pre-owned equipment desired for your practice, Gold Coast will make every effort to locate this for you. A variety of customer friendly leasing and purchase options are also available. As an authorized distributor of many lines we are able to offer some of the best prices in the industry and we guarantee what we sell. Not only does Gold Coast offer new and used equipment to fit every budget, we also purchase used equipment at very competitive prices. In addition, we offer a very customer-friendly “trade-in” program where you can trade in your older ophthalmic equipment for credit or cash toward new equipment. Call and let us make you an offer today! Gold Coast is dedicated to providing reliable and timely service to the ophthalmic community. Our factory-trained technicians service a wide variety of ophthalmic equipment. We understand your practice’s needs and our goal is to make sure the service we provide to you is efficient and professional. We offer many repair options. Our factory-trained technicians can often complete service and repair your equipment at your office. We have a state of the art repair facility to accomplish the more technical repairs. For convenience, we offer the option for customers to ship equipment to us for repair, cleaning, or calibration. Many times, we can provide the convenience of loaner equipment in order to keep your practice’s downtime to a minimum during the repair. * Exam Chairs * Exam Stands * Acuity Screens * Slit Lamps * Ophthalmoscopes * Retinascopes * transilluminators * Phoropters * Auto Lensmeters * Auto Refractors * Non-Contact Tonometers * Goldman Tonometers * A/B Scan * Pachymeters * Topography and Tomography * Projectors * Keratometers Please contact us for a complete list of equipment serviced. We have many refurbished options to fit every budget. Please contact us for pricing and in stock information. We sell a wide variety of new and used ophthalmic equipment including phoropters, refractors, tonometers, chairs and stands, bulbs and lenses, digital imaging equipment, hand-helds, auto refractors, slit lamps, pachymeters, and much more. We carry premier new and used ophthalmic equipment including but not limited to Marco, Oculus, Heine, Sonomed, Reichert, Reliance, Volk, Topcon, Zeiss and many more. Gold Coast offers a large equipment inventory to supply all of your practice’s ophthalmic needs. We have a extensive parts inventory including bulbs, batteries and many of the common parts for most makes and models of equipment. We ship fast to anywhere in the country at low prices. Gold Coast offers affordable Preventative Maintenance programs for up to five years to keep your equipment operating at optimal performance. This smart plan will extend the life of the equipment in your practice and keep your repair costs and down time to a minimum. These plans will allow your office to eliminate the uncertainty of the cost of repairs from year to year, while lengthening the service life of the instrument, lessen down time and ultimately save your practice time and money. Please contact us to determine if your practice’s equipment is eligible for this great program. Gold Coast can assist in developing a logical and systematic move process for your practice. We can provide a budget friendly placement and remodel strategy of your office to facilitate the most efficient layout and use of the planned space. Gold Coast also offers experienced moving and set up options to assure the move to your new office goes smoothly. Gold Coast’s skilled technicians can securely move your fragile ophthalmic equipment. We will disconnect, pack up, transport and set up your equipment at the new location making this process as pain free and simple as possible. Gold Coast offers service and sales you can trust. Call us today to experience the Gold Coast difference! Gold Coast Ophthalmic Instruments, Inc.